Purple is difficult to photograph. The florets were dark blue on the outside but purple inside. 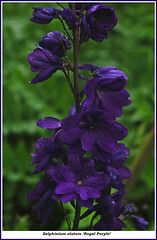 Grown from seed of a Delphinium seen on the Southern Shore of the Avalon. Seedlings have come true to the parent. VERY TALL - over 6 feet.